Happy 4th of July, ‘Murika! What is more American than a new Mastication Monologues post about stuffing my face with delicious food that comes in gargantuan portions that would feed a family for a week? Nothing…well, except maybe this . 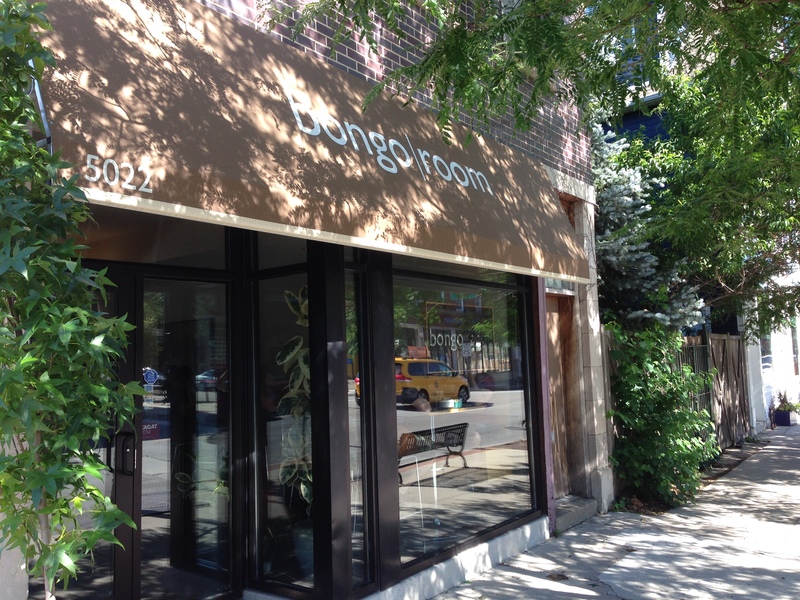 Today’s restaurant review takes me to Andersonville in Chicago to the famed Bongo Room. I had heard through the grapevine that this establishment knew how to sling some delicious brunch items to fill some growling, hungry and possibly hungover bellies. I knew I had to check it out since I also caught wind of their portion sizes being insanely large. I went there on a weekday morning, and I found it quite easy to park in their minuscule parking lot on the side along with procuring a table upon walking in. However, they don’t take reservations, and if you go on a weekend, you will have to brave the hungry hordes that I often see milling about outside their doors. 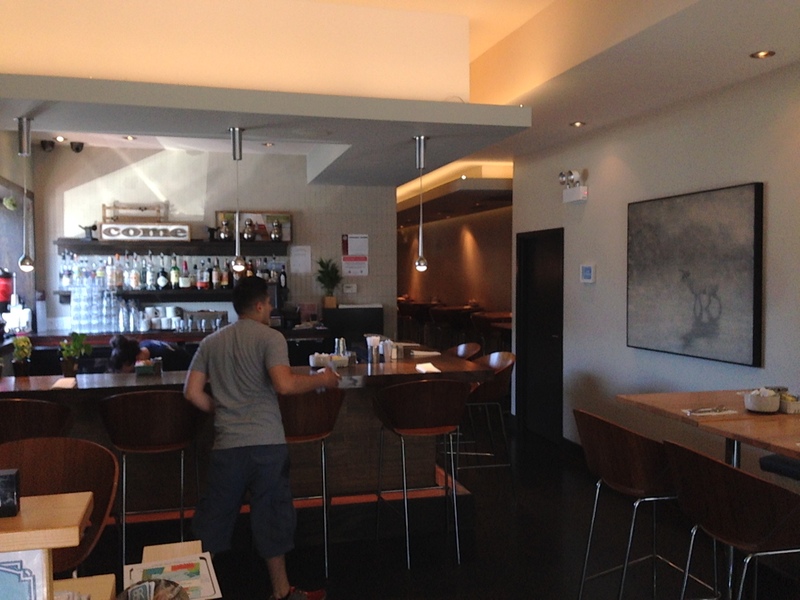 Anyway, I was just there by myself, so I decided to sit at the bar since I didn’t want to take up one of the larger tables that were perfectly spaced and designed for the dining room. The bartender gave me the main menu along with a list of specials. It wasn’t as extensive as a Greek diner or other chain breakfast places I’ve been to, but they did have plenty of creative entries like a similar Andersonville diner, M. Henry. I looked over the omelets, French toasts, and pancakes they had to offer, but it was like trying to pick your favorite child. So, I asked the bartender what she would recommend, and she picked what I was leaning towards initially: white chocolate and caramel pretzel pancakes ($10.50). After a bit of waiting, they finally came out. I honestly didn’t know how they managed to fit in the pretzels in this plate that looked almost like a canvas that should be hanging in the MOMA. I almost felt bad that I would have to sully the milky white and golden lattice pattern that covered these monstrous cakes, but I sallied forth to my delectable date with destiny. From the first forkful I was hooked. 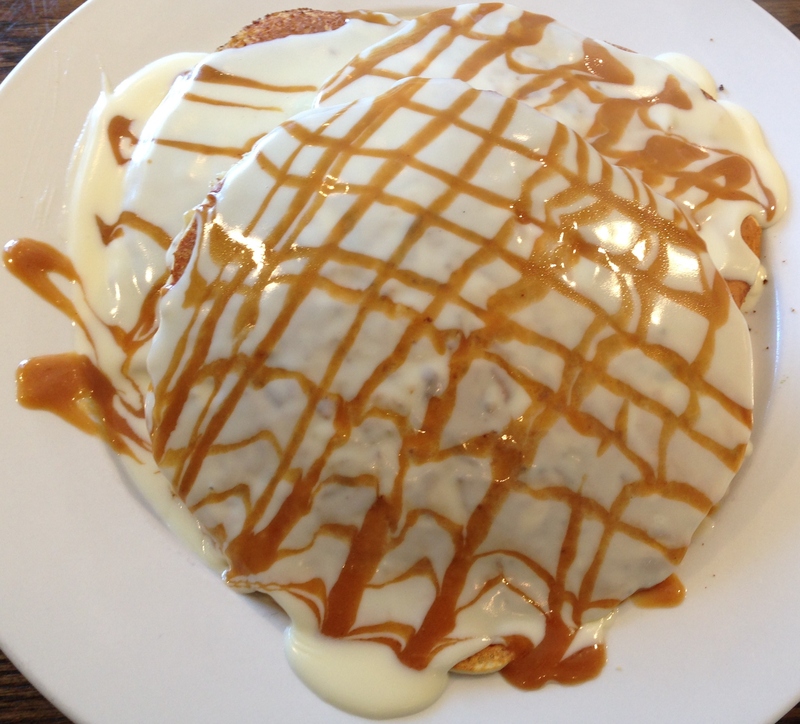 The actual pancakes were light and fluffy, and the white chocolate sauce that covered them wasn’t thick like frosting but rather an extremely thin syrup made thicker with the presence of divine caramel. 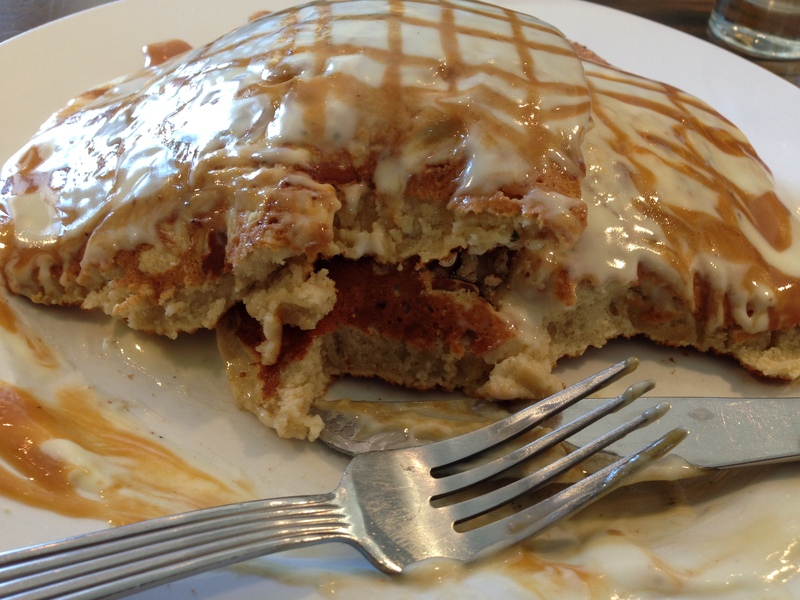 This sauce was the key to the success of these pancakes while at M. Henry I was very disappointed in their bliss cakes. M. Henry went the healthy route with berry juice, but the problem was that they used way too much of it. The sauce itself was too watery which the cakes absorbed too quickly, and in turn, left me with a plate of soggy flapjacks. The Bongo Room, on the other hand, did coat their pancakes with a lot of sauce like M. Henry but with just enough to coat every inch of them and no more. I didn’t interrupt another pancake pool party for breakfast. Plus, the sauce was thicker which meant that it infiltrated the pores of the pancakes much slower than the thin berry juices. Take notes, M. Henry. You have good ideas and ingredients for bread-based recipes, but you need to tweak them to make them truly great. Anyway, there is also the pretzel element of this dish that I found quite novel. As I cut through my meal, I would occasionally be greeted with actual pieces of pretzels, salt and all, between the sweet folds. I inquired with the bartender how they integrated these pretzel fragments into the meal, and she said that they are sprinkled in as the cakes are on the griddle. 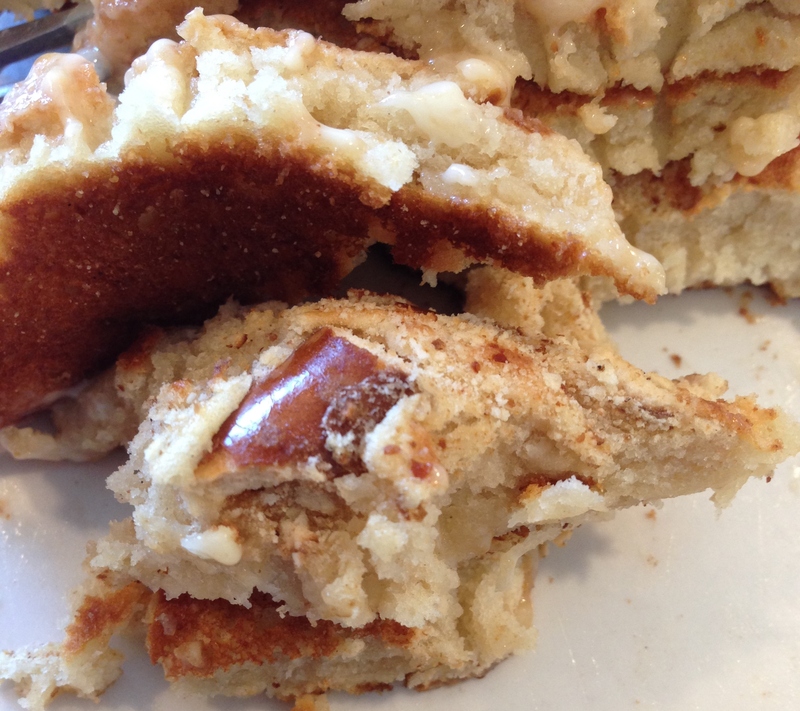 Much to my surprise, they were not soggy at all and provided a great crunch to offset the more delicate pancakes. The saltiness of the pretzels were a double edged sword since it was a masterstroke to combine it with the sweet white chocolate and caramel, but at times towards the end of the meal, the salt seemed to be a bit too much for my palate to handle. Either way, this snowy white chocolate dish left me in a winter wonderland in the middle of summer. I ate all of it so fast that the bartender asked if I wanted to lick the plate, but I wanted to preserve a bit of self respect after the dust settled from my feeding frenzy. I was greatly satisfied by The Bongo Room. 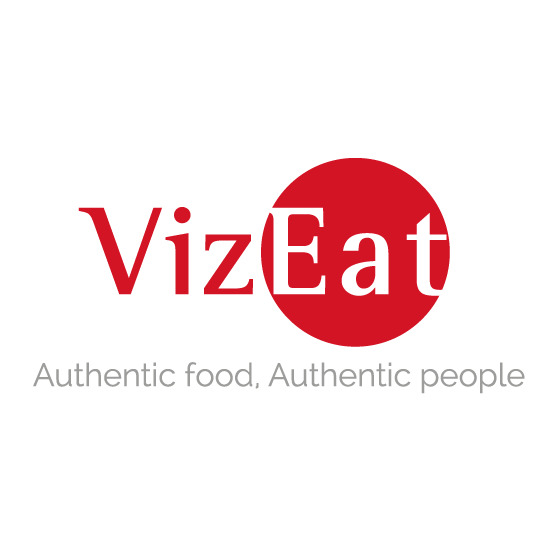 From service, environment, price, portion size, and overall quality, they got it all. Even though their menu isn’t encyclopedic in comparison to other nearby establishments, The Bongo Room makes up for it with fewer dishes done so well that they make everyone want to come back for more. Just don’t cut in front of me while we stand in line, and I’ll see you there.